We currently deliver instruments to schools in Longmeadow, MA, Farmington, Windor, Avon, and Simsbury, CT, and September Deliveries to schools in/surrounding Poughkeepsie NY. Please note our shop hours. We are closed Sundays and Mondays. Many first-time rental customers will need a method book. If your book is not listed, please let us know what you need - we probably have it! Name of the person playing the instrument. Because we do not take a security deposit, we require a Driver's License number on file. Auto payments will be charged to the Renter's provided credit card every 3 months until the contract is cancelled. Most customers opt in for our automatic billing option. We will automatically charge your card on the due date. For those who do not want an automatic payment, we will bill you 30 days before your due date. Upon receiving your application, we will contact you for payment information. We will need an active Visa, Mastercard, AmEx, or Discover card on file at all times. If you have any questions or would like to provide payment info now, please give us a call at (800) 766-0936. *The minimum rental period is three months; there will be no refunds given on rental of any duration. *We charge an initial shipping fee of an instrument or bow via UPS ground service. After the initial shipping charge, we will cover the cost of shipping instrument exchange and repairs from the shop back to you. You are responsible for the cost of shipping instruments and bows back to the shop. *Renters may trade up in size at anytime (subject to availability). Changing size does not affect rental fees. When exchanging instruments by mail or UPS, your instrument must be returned to the shop by the due date listed on your packing slip. Late returns will be assessed a late fee of $6.00 per week overdue. *We send an invoice for the next rental period during the last month of each rental period. If you wish to renew your rental, simply send us a check or call to authorize credit card payment. If you opted in for 'Auto Charge', we will charge your account on file. If the card is declined, there will be a $5.00 conveneince. If you wish to return the instrument, do so on or before the renewal date to avoid incurring additional costs. *We need a current address, telephone number, and credit card number on file at all times. It is your responsibility to notify us of any change in address or telephone number or if your current card expires or is cancelled. In order to avoid unnecessary charges, it is important that you follow our return procedures. Returns can be accomplished in one of three ways. 2. Ship your instrument to the shop. UPS is recommended. Call or visit our website for shipping instructions as the customer will be liable for damage caused by improper packing. It is very important that you include your name and phone number as we are unable to process unlabeled returns. 3. Call to arrange for us to pick up your instrument at one of our convenient drop off locations. All returns must be labeled with your name and phone number as we are unable to process unlabeled returns. THE CUSTOMER IS RESPONSIBLE FOR CONTACTING STAMELL STRINGS TO RETURN THE INSTRUMENT. *Broken strings will be replaced free of charge with rental quality strings chosen by Stamell Stringed Instruments. Extra sets of strings of any kind are not included but may be purchased at a discount. *Insurance is not valid outside of the U.S., or in the case of gross negligence on the part of the customer. If your account is past due, the insurance coverage will no longer be valid. Customers will then assumes all liability for damage, loss, or any repair work necessary. Any unauthorized work performed on our instruments is not covered by our policy. Equity accrues are the rate of 100% of the first year’s rental fee, plus 60% of the second year, plus 20% of each additional year (not including insurance or tax). Full equity may be applied to the purchase of an instrument. *Accounts past due by at least 15 days will be charged a late fee of $15.00 per month. *Rental accounts past due by 30 days or more can be charged directly to the customer’s credit card without further notice. If the credit card transaction is denied, late fees will continue at $15.00 a month. * If an account is past due by 60 days or more, it will be assumed that the customer is purchasing the instrument, and the customer will be billed accordingly. Stamell Stringed Instruments may also be entitled to charge the customer’s credit card for the value of the instrument. *Collection procedures will begin if an account is past due by at least 90 days. If your account is overdue, you are responsible for any damage, loss, or other costs related to repairing or replacing the instrument. Please read our Rental Instrument Damage and Repair Policies below before submitting your form. Loss, theft, general maintenance, and normal wear and tear are covered by insurance. Damage to an instrument will be assessed on a case by case basis at the discretion of Stamell Stringed Instruments. Please note that if your account is in bad standing, insurance will not apply. 1. 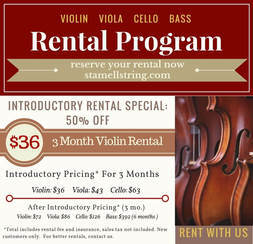 )Insurance is included with all rentals from Stamell Stringed Instruments. Insurance covers normal wear and tear, open seams, loose fingerboard, peg adjustments, broken bridge or bridge adjustments, soundpost adjustments, bow re-hair and repair, gluing, and normal maintenance. 2. )The customer’s account must be current for insurance to apply. Past due accounts must be brought up to date immediately, or normal repair costs will apply. Stamell Stringed Instruments also reserves the right to repossess rental instruments brought in for repair which have accounts in arrears. 3. )Gross negligence is not covered, such as etching into varnish of the instrument, improper storage, improper transportation, leaving instruments or bows in unsafe situations, or other improper use of instruments and bows. 4. )Insurance coverage is not valid outside of the United States. Shipping of instruments is not allowed without written approval of Stamell Stringed Instruments. 5. )Our 3 Strikes Policy: As a renter of one of our instruments, you are responsible for the safety and condition of the instrument and bow. If repeated damage is noted on your account, Stamell Strings reserves the right to cease renting to you. 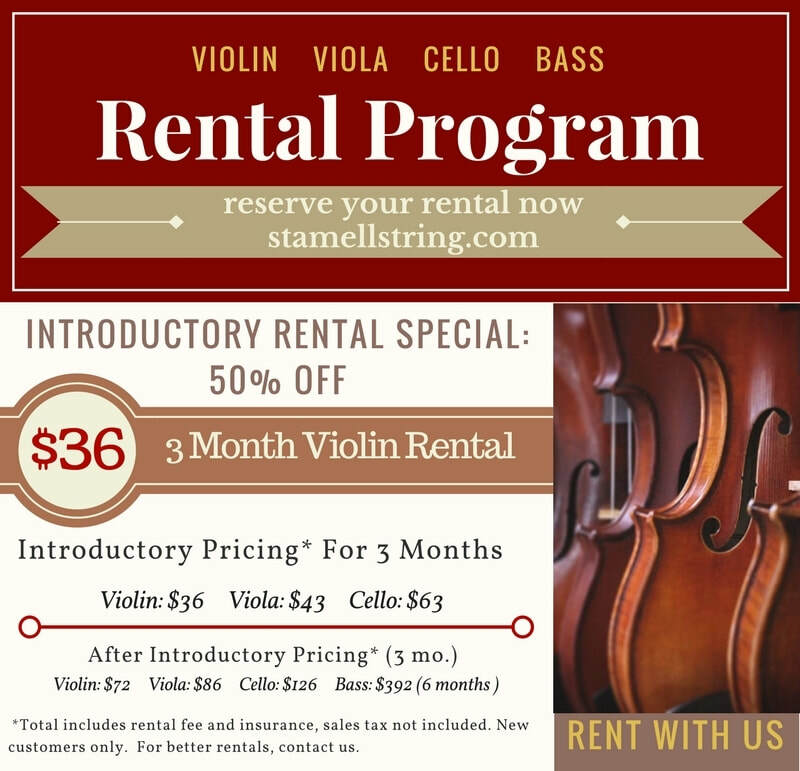 Upon the third incident of breakage or accident, Stamell Strings may opt to stop renting to you, and will return the balance of the prepaid rental term, less any repairs needed to the instrument or bow. 6. )If a rented instrument is lost or stolen, the insurance will cover the loss as long as a police report is presented to Stamell Stringed Instruments within one week of the loss. If there is no police report, the customer must pay Stamell Stringed Instruments the replacement cost of the instrument/bow, the value of which is solely determined by Stamell Stringed Instruments.